A few weeks ago, ChefUniforms.com held a contest, in which the winners would be sent to the National Restaurant Association Show in Chicago, Illinois. John Schulze was one of our top contestants. Though he was not the winner of the grand prize, we were impressed with his recipe and entry essay, and wanted to learn more about him. The following is our interview with Chef John Schulze. My uncle is a chef in Atlanta, GA. I worked with him when I was 14 and I had a feeling then that it was my calling. Formal culinary training and apprenticeship with a program accredited by the American Culinary Federation. The best training is working with an experienced, well-respected chef. Yes, now people want minimally processed foods. It’s funny that this is considered a new trend, because making everything from scratch is the way I was trained. I don’t use short-cuts. Seasons are too short for local produce in this part of the country. We have great local produce, and I love working with local farmers, but I just wish the seasons lasted longer. Local independents are having trouble competing with big chains. We can’t compete on price, but we can compete on quality. As consumers demand quality, they’re coming back to the small, local restaurants. 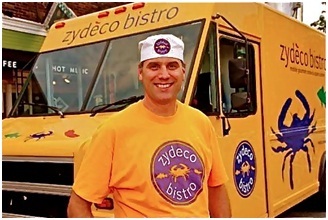 The recent surge in popularity of food trucks is a good example of that. People are learning that you don’t have to give up convenience to get good food. Food trucks mobile restaurants are here to stay. It’s important to set the example for them to follow and hold them accountable. Standards must be established and followed, and obtainable goals must be set. Cross-training is the best method to build a team environment. Yes. I cook the way I prefer to eat. I cook with whole foods–fresh local produce, meats, and baked goods. I do sometimes enjoy going out to eat things that are completely different from what I cook, such as Pho. There are a few good places to get Pho in Cleveland. Do you try to experience the food at your competitors? Yes. I try the food of the trucks who are my competitors. In fact, we share food between trucks regularly. Do you ever get ideas from competitors? I try to make my food unique so it stands out. Definitely. To judge quality, you have to see, smell, and touch food. Before a new item is added to the menu, I give customers samples and ask for their feedback. Of course, I also rely a great deal on past experience–I have a good sense of what will work based on what has worked in the past. Select a theme, and stick to it. I have found that a menu that is simple and sophisticated works best. It’s important that you build a menu around good quality ingredients. It’s not necessary to source ingredients from thousands of miles away to develop a successful menu. What is necessary is to use the best ingredients, and to use them correctly. 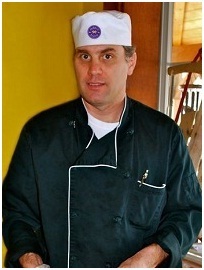 John was kind enough to share a recipe with us here at ChefUniforms.com, and we’ve posted it below, so read on!